Bringing you all some Christmas Joy!! this cute little card I made a while back, but I just love it!! 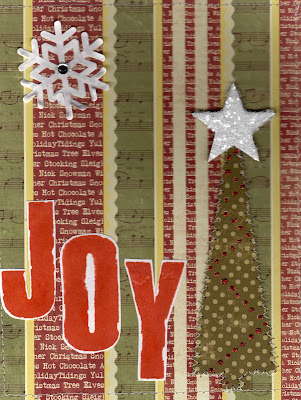 Made with Melissa Frances paper, Close To My Heart Rustic Stamps, inks. glitter, red stickles. I sewed the little tree on the card. So much to finish up before Christmas Eve, little more shopping, I haven't even done any of my baking like I do. This Christmas has come so fast and money is short, we have been trying to make homemade gifts, plus we have cut way back on gifts. Let's remember the Real reason for the Season: Jesus birth!!!! !